More than 90 percent of the graduates in the Tennis Management program at TJC find full-time employment, in many cases before they graduate. 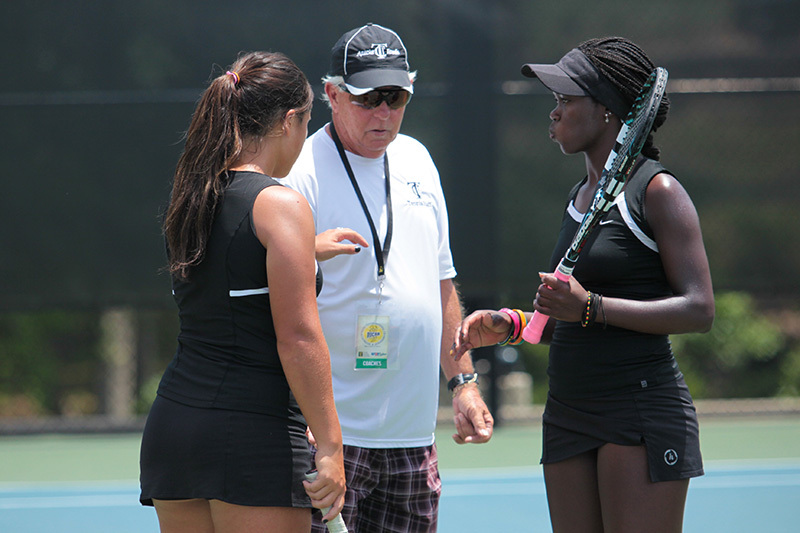 TJC Professional Tennis Management has conducted quality Management Programs emphasizing Tennis Teaching Instruction and Management Skills since 1974. Tennis Tech offers Associates Degrees and a one-year Certificate Program in Business and Recreation Leadership. This program provides a two-year course to train students in teaching tennis, planning programs for tennis facilities, merchandising and operating pro shops, and maintaining tennis facilities. In addition, students are trained and prepared for certification testing. Students spend 15 hours per week on lab work, on-campus tennis clinics and functions of team coaching. Training aids used in the tennis program are books, video and audio recorders, ball machines, and stringing machines. For more than 20 years our tennis teaching program has attracted students from more than 35 states and 20 countries. Endorsed by the USPTA, the Tennis Tech program at TIC is dedicated to showing our students that being a professional in the tennis world involves more than playing tennis. We will teach you the ins and outs of the tennis business, while serving up the courses you need to run a successful business. Additionally, our expert and nationally ranked staff will bring you to the net and coach you on how to teach tennis and polish your own playing skills. Through our one-year training program, students prepare for teaching tennis, planning programs for tennis facilities, merchandising, operating pro shops and maintaining tennis facilities. Program Director Kimm Ketelsen is a certified teaching member of the United States Professional Tennis Association. Kimm has 25 years experience as a director of tennis, is nationally ranked in top 10 in USA, has been the assistant coach for University of Texas Austin's Women's Tennis Team - National Champions 1995, and is a two-Time NAIA All-American. Our graduates work as fitness professionals in commercial gyms, medical and sports performance facilities where salaries are only limited by how hard you’re willing to work.